Every minion has a type and specific stats. Poppets: all humanoid Wind-up minions (Gentleman, Y'shtola, etc). Monsters: beast minions (Bomb, Baby Bun, etc). Critters: creatures of Eorzea (Lesser Panda, the Bluebird, etc). 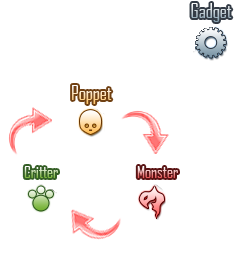 Gadgets: machines or special minions (Wind-up Cursor, Wind-up Airship). Every type beats and is beaten by another one, except for Gadgets. Here is the chart. HP: when they reach 0 your minion can no longer fight. ATK: determines the damage done by your minion. DEF: determines the damage reduction when your minion is attacked. SPD: rated from 1 to 4 stars, determines the movement speed of your minion. Auto-attack: a minion's standard attack. Can be solo target or AoE. Special action: an action that uses points and has a special effect. More about this a bit further. Cost: number of points needed to put the minion on the battlefield. More about this on the next paragraph. Strengths: each minion is strong against specific structures. Every minion has an initial cost, which can be one of: 10 (Bomb), 15 (Cursor), 20 (Goobbue), 25 (Little Panda), 30 (Gentleman). Usually, the more you pay, the more powerful the minion is. But it will also take longer to summon the next one. You have 60 points before the game starts. You can put as many minions as you want on the battlefield as long as the sum of their costs doesn't exceed these 60 points. You can also have several units of the same minion out. When you recall a minion or when it's defeated, its cost is refunded. Also, you can have up to 240 points during battle. Each minion gets Special action points (let's call them SAP) over the time. A circle under each minion will display their current number of SAPs. When the gauge is filled, if 4 minions of the same type are in close range and all have their SAP gauge full, you can use the Special action of one of them. Some Special actions place a trap on the field. You can trigger them manually after 10 seconds.